As SEIU Public Division leaders shared war sto­ries from the front lines of this recent recession, it became clear that a new approach was called for. People agreed that we can’t get ourselves out of this mess by running the same campaigns or even doing the same thing better. And members were frustrated. They wanted to see our union defending them, but frequently the boss wasn’t the problem. A good boss fight might yield a slightly bigger slice—but the problem is the size of the pie. Through these shared frustrations, the concept of going on the offense was born. Fighting for more revenue is the essential ingredient to protecting public services and is a basic part of our offense strategy. On a state level, that’s politically viable now in only a handful of SEIU states. So our offense work began to look at local revenue-raising options. And we look at building support for raising revenue over the long haul as well as making workers part of the solution. In the midterm, we can do things that save government money and help people feel more confident that their tax dollars are being spent wisely by highlight­ing budget savings and ways to make government more efficient. As the ideas around offense coalesced, Division leaders aimed to support locals undertaking an offense approach to their work. In 2011 and 2012, SEIU’s Public Service Division provided resources for a range of offense projects in nine states: Oregon, Michigan, Washington, Connecticut, Pennsylvania, Minnesota, Florida, Illinois, and special retirement security work in California and Oregon. These six to nine month projects allowed locals to hire staff and develop lost-time programs to execute an offense project. Through work in the projects, members and allies piloted strategies to change the debate around public services, built support for raising revenue by ensuring the rich and big corporations pay their fair share, stood up for closing unfair tax loopholes that unfairly burden the middle class, positioned the union as part of the solution in closing a budget gap or safeguarding taxpayer dollars, and advocated for retirement security for all. This report highlights some of the most successful strategies in our campaigns as well as lessons learned from the challenges we faced. It also takes an in-depth look at our efforts with member education, leadership and action as well as other ways in which local unions worked to build our movement’s capac­ity for the future. 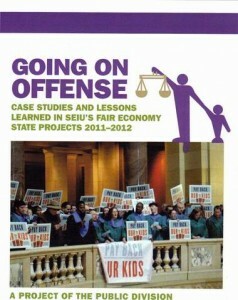 SEIU Local 517M projects are featured on Pages 13, and 20-22. These include the state employee New Solutions work and the Saginaw area New Solutions work.